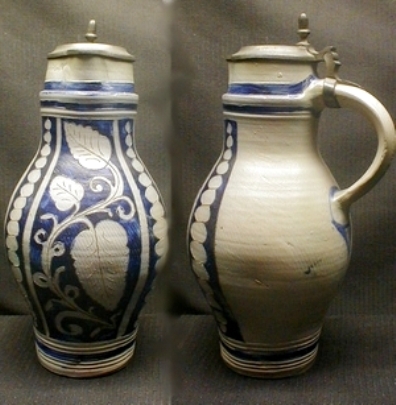 “Westerwald,” stoneware, OOC (oil on canvas) of a 1 liter stein, which is circa 1790. 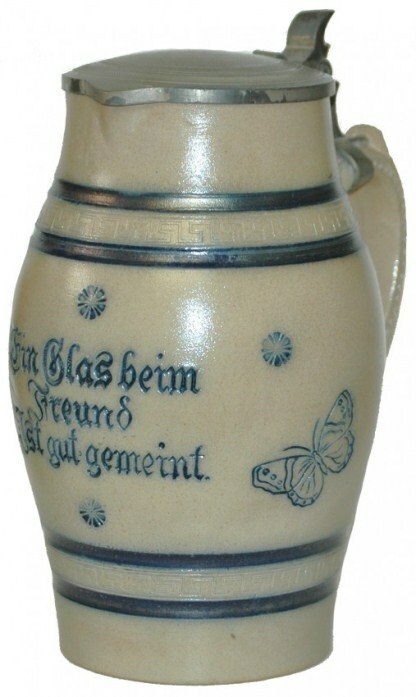 W.Mühlendyck mark called butterfly ..
Wager cup – The word “cup” is the “misnomer” here, it is really a “game beaker” to be used in a pub or for home games with guests. They usually have dice in the bottom; and there are 100’s of different games to be played. 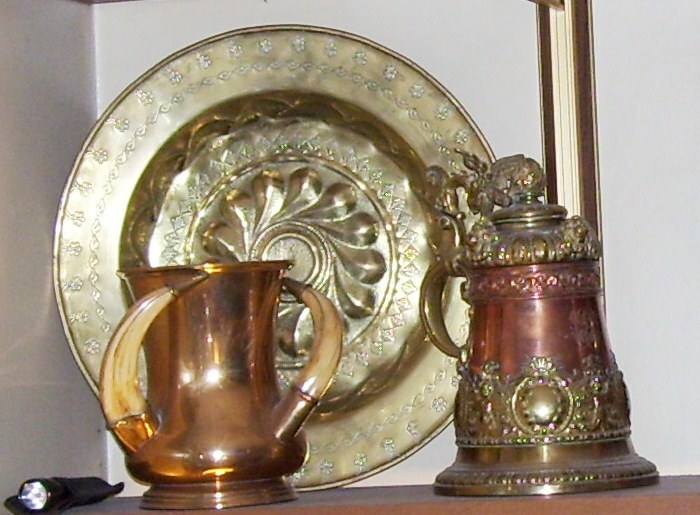 Some modern pewter steins have the dice in the top. 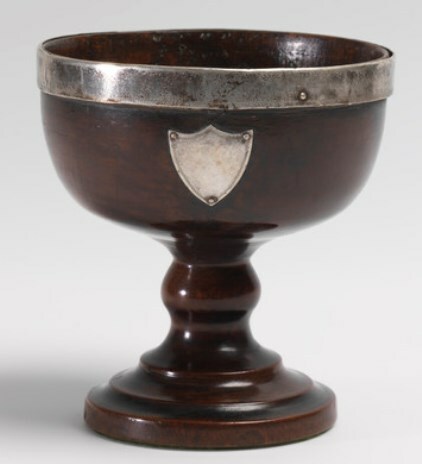 Shown: A wager cup done in “Old Sheffield Plate,” England, Ca. 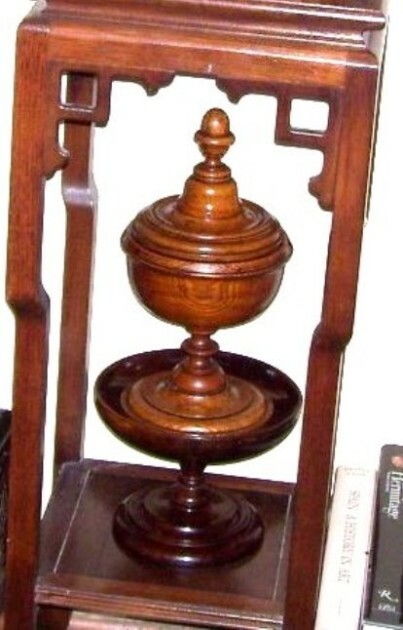 late 1700’s. [FWTD] There are 3 dice in the glass enclosed bottom. 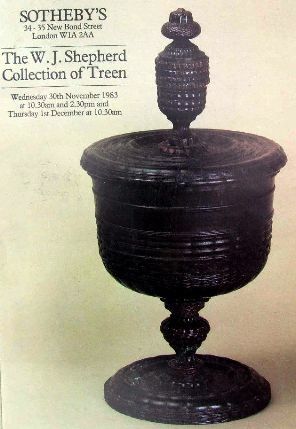 Also seen is a version with Irish coins made for that market. 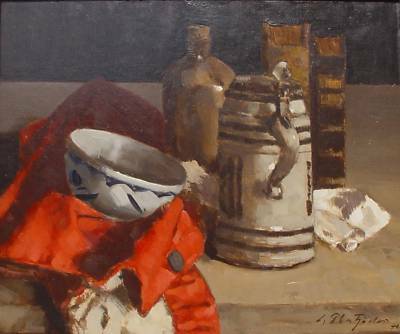 Detail of scene described below▼. 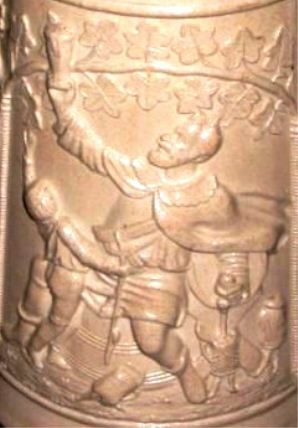 The scene shows Gambrinus holding up a pokal away from a young boy who wants it. Meanwhile “The King of Beers”*** is holding open a tap and a couple of steins are walking under it being filled up. (*** But not the Patron Saint of Beer = They are real Saints and there are many of them! Walhalla (Germ.) – Valhalla (Eng.) - NOTE: Walhalla is the German form of Old Norse Valhöll, which is commonly anglicized as Valhalla. 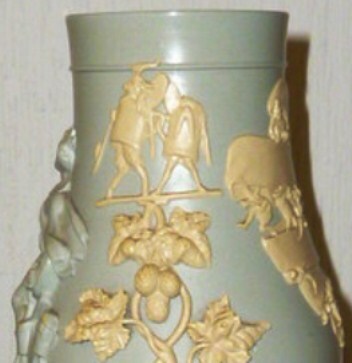 Shown ▲ ▲: 2 liter pottery relief stein with scenes not seen very often with the Danish spelling= “Walhall.” This type of vine handle indicates it was made by J.W. Remi. [FWTD] Also see: Vikings” for the Gods represented on this piece. In old Norse mytholgy “Valhalla” (from the Old Norse: “hall of the slain”) is a majestic, enormous hall located in Asgard ruled over by the god Odin. Chosen by Odin, half of those who die in combat travel to Valhalla upon death, led by the Valkyries while the other half go to the goddess Freyja’s field called Fölkyangr. In Germany, The Walhalla Memorial, The Hall of Fame, inaugurated 1842. Walzenkrug (Germ.) 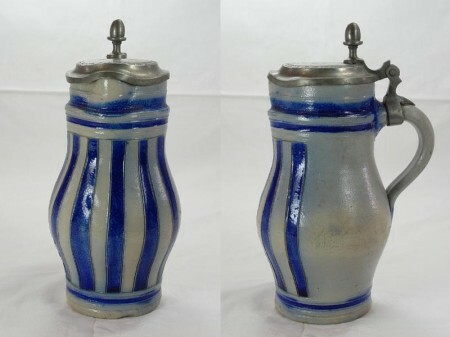 – Straight sided jug or tankard, used primarily to describe the older non-production line, hand thrown pieces such as early fayence and stoneware steins. 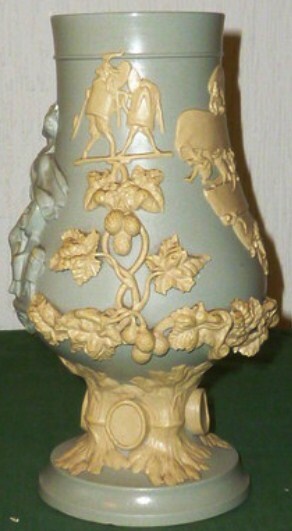 Shown: A late variant fayence stein, . 5liter. 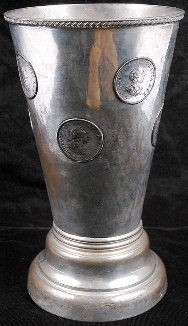 Circa 1810-40, with nice pewter “urn” thumblift. 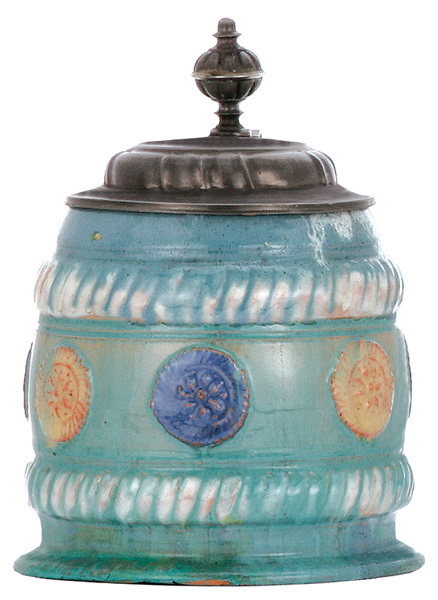 This type flat pewter lid is usually seen on glass steins of the same period. 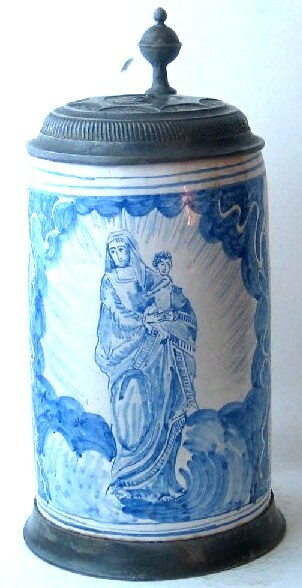 A Regensburg stoneware beer server with probably a family’s coat of arms (copied from some museum piece?) 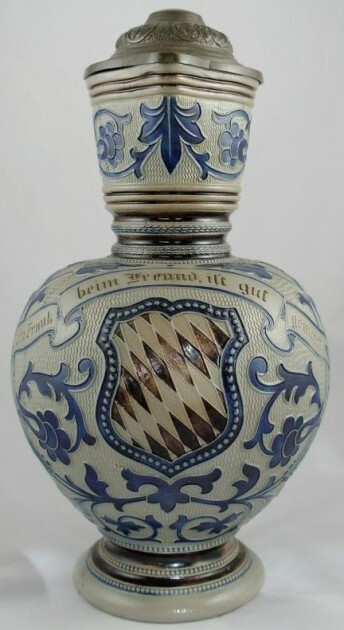 Very similar pattern to the Bavarian arms. 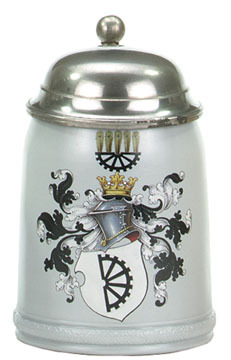 Wappenkrug – German for the steins that display two or more coat of arms, usually German cities close by each other or major metro areas. 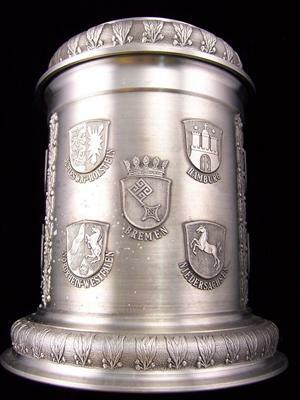 Shown above: “Brand New” pewter with the “Arms” (not Crests}) of the major cities of Germany.This make the stein saleable at many locations. 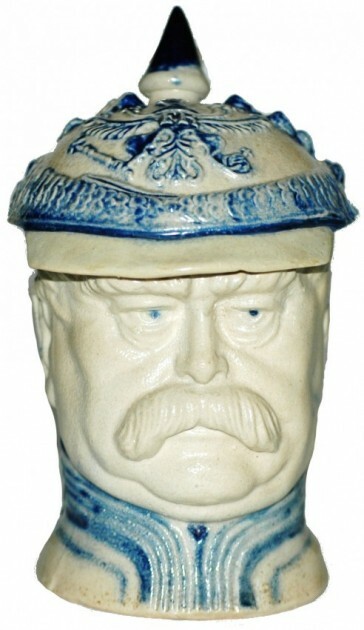 Ward, Rowland – maker of newer but well done German blown and engraved beer mugs. Warrant Marks. 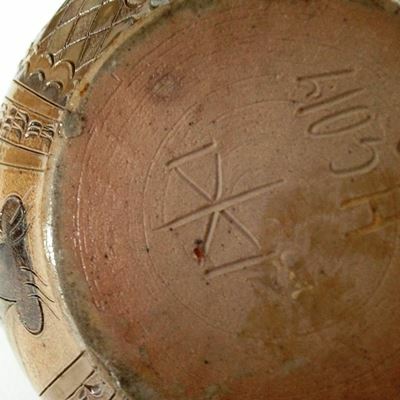 – These special marks were used on Russian and English silver marks and indicated the selected Gold-smiths / Silver-smiths were used to make household objects and gifts for those Imperial Courts. 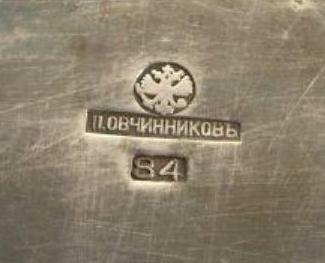 Warrant Mark, [above the name] Russian – The Russian silver-smith is Ovchinikov. See “Assay Mark” in this Compendium. Warth, Christian – A prominent German artist who did designs for V & B Mettlach, such as above ▲ and below ▼. V & B wall plaque by Warth. – No. 1652 -1900 . His signature is on lower left at about 7:30 on a clock. 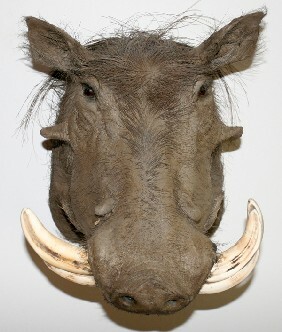 Warthog tusks – Used to decorate lots of drinking vessels and other items from Germanic countries, as below ▼. 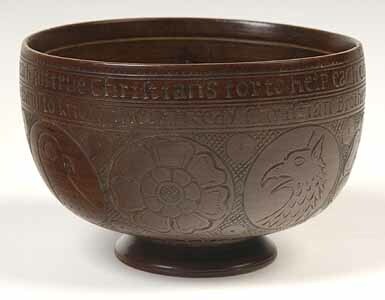 ▼ Newer custom made “Wassail” bowl with medieval style grotesques engraved on the body made by a present day wood-smith in England. Wassail comes from the Old English words waes hael, which means “be well,” “be hale,” or “good health.” A strong, hot drink (usually a mixture of ale, honey, and spices) would be put in a large bowl, and the host would lift it and greet his companions with “waes hael,” to which they would reply “drinc hael,” which meant “drink and be well.” Over the centuries some non-alcoholic versions of wassail evolved. Watch on the Rhine – “Germania” on the river’s ledge awaiting to defend her Germany. 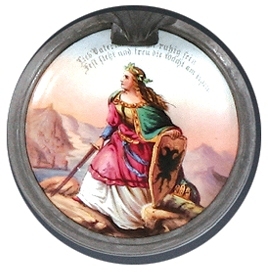 Shown: Porcelain lid insert and early one as it has the double headed Imperial eagle on her shield, which changed to a single head in 1871. Webster-Wilcox Silver Plating Co. – Founded in 1865, with Jedediah and Horace Wilcox, Charles Parker, Aaron Collins, Hezekiah Miller as the primary partners, as the Wilcox Britannia Company in Meriden CT. The name was changed in 1867. 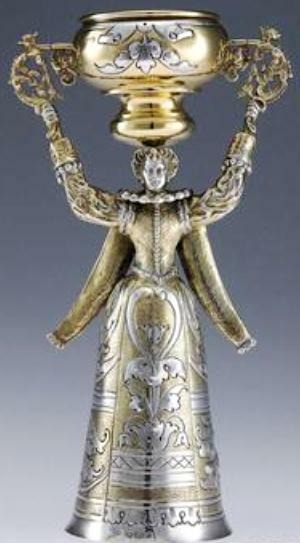 It was later one of the founding companies of International Silver in 1898. The company plant was closed in 1941 due to the war metal shortage. After the war, its house designs were made by other International factories, but the company as a separate entity was not revived. In 1961, various divisions were consolidated and its name was changed to Webster-Wilcox. 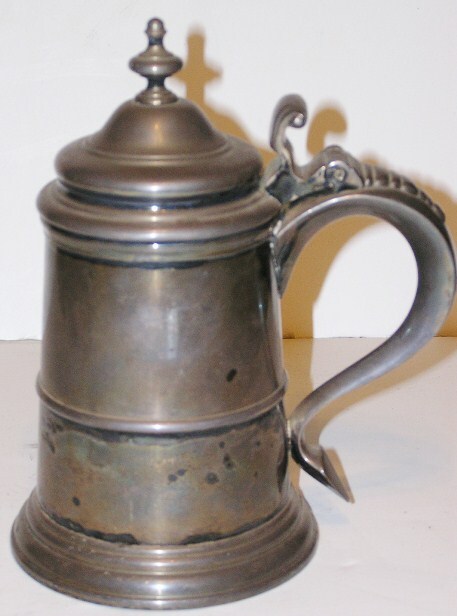 Shown: Copy of an American Revolutionarystyle tankard. (Paul Revere’s?) 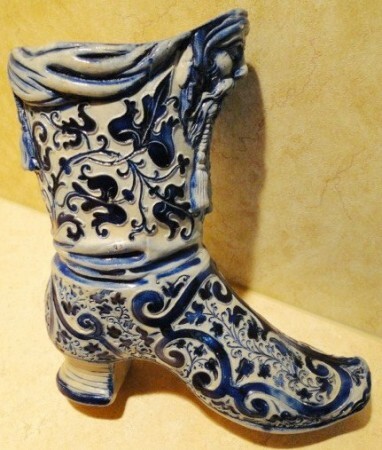 8.5 inch tall. Done in silver plate. Unknown manufactured date, but after 1961. 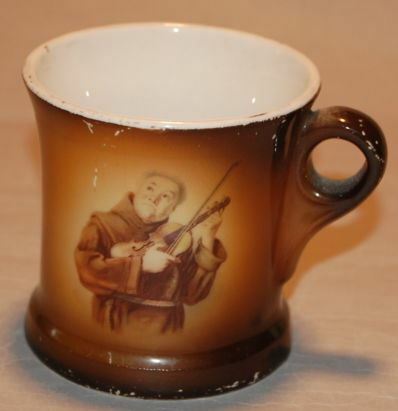 See: “Paul Revere tankard” also. 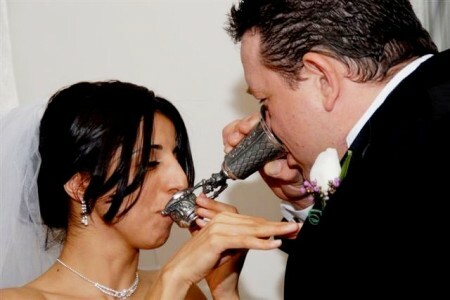 Wedding Cup (also called Marriage Cup and wrongly: Wager Cup) – Shown: The correct way to use this cup; featuring Mr. and Mrs. Michael Stephen Smith, April, 2008. 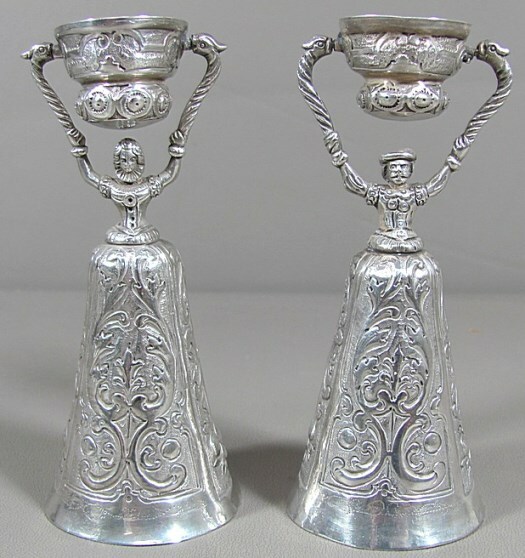 ▲ Antique German .800 silver silver wedding cups. 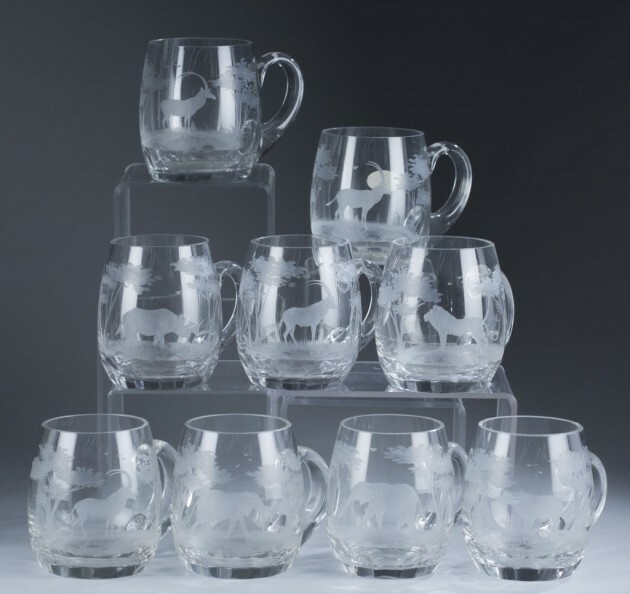 for more See: ‘Jungfraubechers’= Wedding cups; not wager cups! 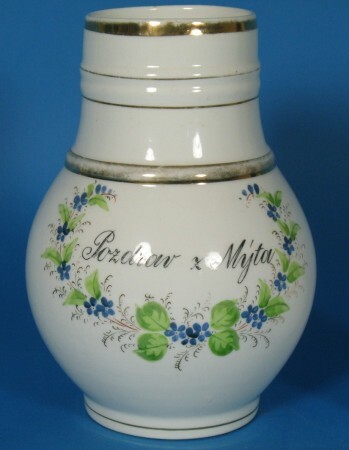 Wekara – Made stein under contract for V & B Mettlach. 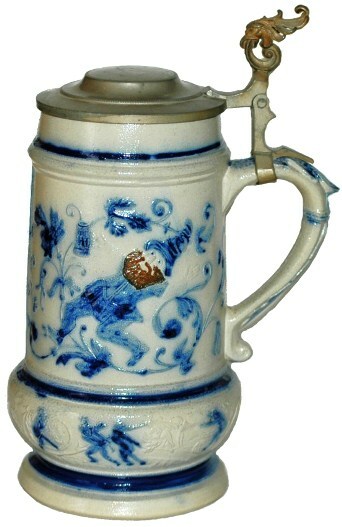 This is a 1/32 Liter, 2.5″ ht., relief of the Munich Child. 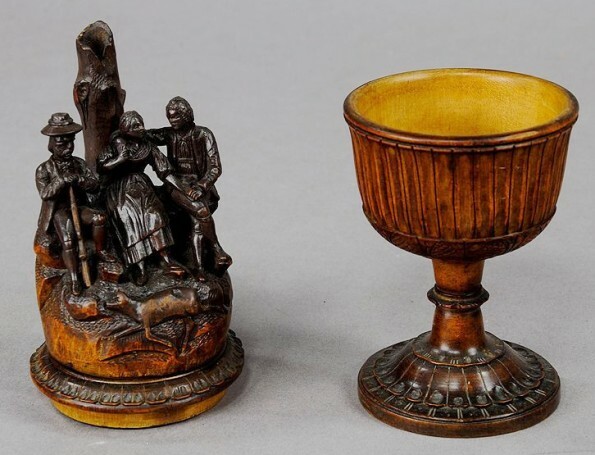 Welcome beaker or cup – A beaker used in European homes and fraternal society meetings to great a guest A custom from late medieval times, even to this day, as in: “Can I get you a Coke? iced tea?” The idea being to liquefy their friend’s parched throat and make them feel welcome into their new environment. 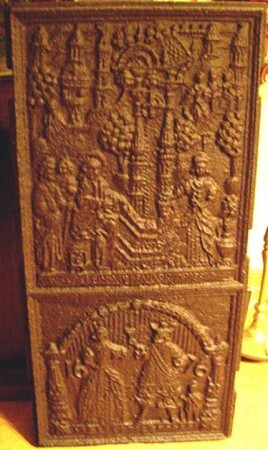 Shown: Part of a 3 part Swiss cast iron fire back, dated 1663. 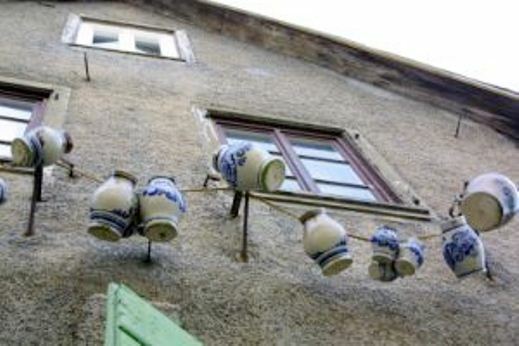 On the bottom section is a “lovely” wife offering her husband a “welcome cup” upon his return home from wherever. 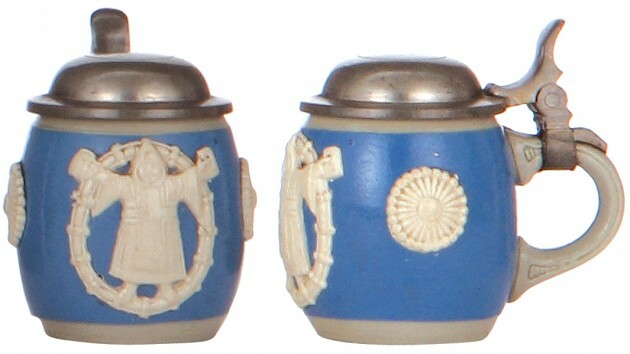 [FWTD] Werkstatt Fischer in Bamberg – Makers of good quality Fayence steins around 1900. They look a lot like older ones from Schrezheim. West Germany, Made in – “West Germany” was in existence from 1949 to 3 October 1990. 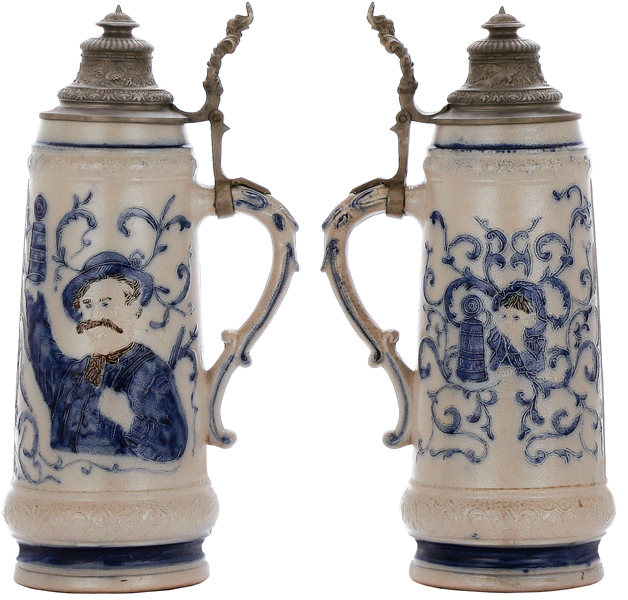 Beer steins made then are considered “New” by SCI collectors. 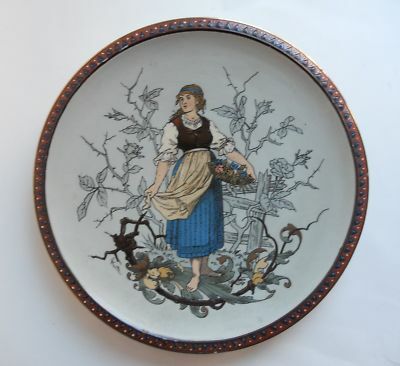 See: “Made in West Germany” on this site’s Compendium for much more info! !